Is solar powered irrigation the answer? Many farmers in Kenya depend on the two rainy seasons in a year to grow their crops.This has been the case for a very long time now, which has resulted in consistent disappointments lately majorly as a result of climatic changes currently being experienced. Rain is no-longer dependable or even predictable. This has also contributed to food shortages like the one currently being experienced in the county. Due to this challenges, most farmers are looking into alternative sources of water for their crops, like rivers, and boreholes. The alternative sources of water come with the need for pumping to get the water where it is needed. 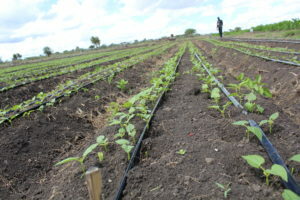 Research shows that lack of sustainable water sources for farming can significantly change the livelihood of farmers because they might experience pre-harvest loss. With pumps, comes need for powering them. Some farmers opt for diesel power sources (generators) while others seek cleaner and better sources of power. The disadvantage diesel generators come with is the high running and maintenance costs, frequent breakdowns and exposure to fuel theft/ adulteration which eventually affects the life of the generator. This leaves us with a more sustainable option of solar power. 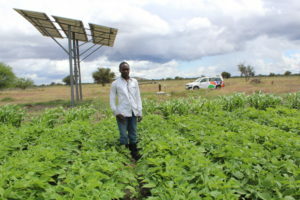 A case in point is of Mr. Githinji, who, opted for the solar powered pumping system and now has the advantage of farming all year round because of the consistent source of water without the worry of running and maintenance costs. 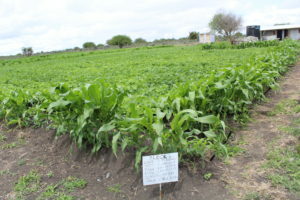 Being an owner of a 12 acre land in Kajiado, he did a lot of research before he begun farming about seven months ago. 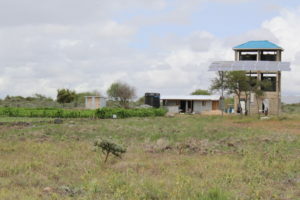 He wanted to practice large scale farming but because of the climate in Kajiado, he knew he needed a constant supply of water which meant having a borehole. Kajiado is one of the forty seven counties in Kenya adjacent to the capital city Nairobi. It is a fertile area but experiences very little rainfall that averages 500mm a year. Mr. Githinji came to us to equip his borehole with a solar powered pump because getting water from his borehole to the farm was a tedious task. The solar powered pump drives water from the borehole to the water tanks. There is tap installed in the tanks which can be opened to allow water to flow through the pipes and is deposited to the crops using drip. This reduces the labor cost as it is a tedious task to manually water the crops which may take days. He has the advantage of irrigating the crops in the morning and evening. During the day, the crops take in the water slowly which keeps them hydrated. Since they began operations about seven months ago, Losiani farm has never lacked water. One of the main advantages they have is that they only incurred the initial costs of installation and do not have recurring running costs unlike when electricity and diesel powered engines are used. Our calculations show that with a 18KVA generator, what Mr. Githinji would have gone for had he opted for a generator, he would be spending KShs. 980,000 (assuming the generator runs 8 hours daily) annually on fuel, service and maintenance and associated loses due to breakdowns. With about 12 acres of land, they have so far planted French Beans on three acres which are doing very well because of drip irrigation. They Look forward to planting other types of vegetables which they are sure will do well. This farm produce is sold to different markets which has created employment and also given Mr. Githinji a steady income. For a continent that has maximum sun hours throughout the day, solar is the ultimate solution to having food security in Africa. Farmers should be encouraged to explore the option because it is a sustainable and free source of energy. It will also go a long way in ensuring that food security is achieved in Africa.